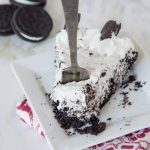 No Bake Oreo Cheesecake – A super creamy no bake cheesecake filled with Oreo’s and ready in minutes! 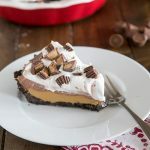 A could years ago, I posted a recipe for No Bake Peanut Butter Cheesecake, and it is still a huge hit. So I thought why not change it up a little and make an Oreo cheesecake version. 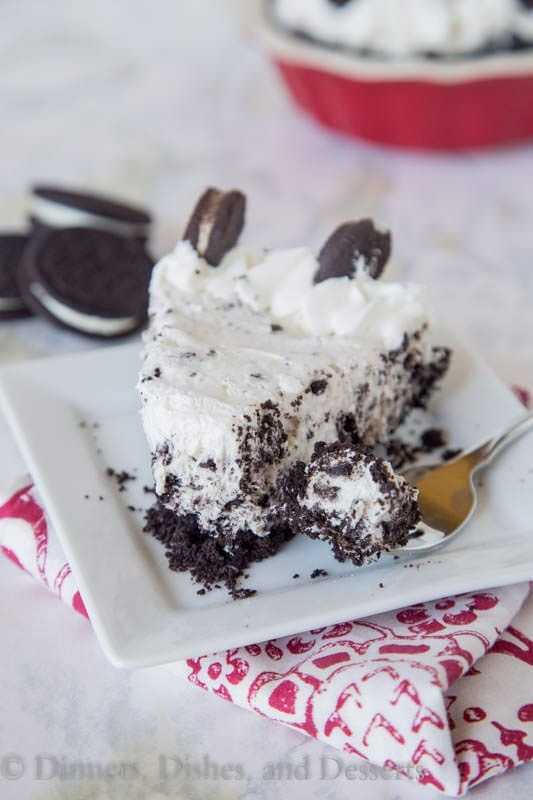 No Bake Oreo Cream Squares are another favorite with Oreos. 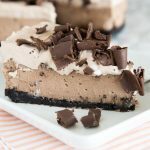 I am not always a huge fan of traditional cheesecake, unless it is Chocolate Chip Cookie Dough Cheesecake, but a no bake cheesecake I am all over. It is almost just like a cream pie. And what is not to like about a cream pie? Especially one that is studded with chunks of Oreo cookies and topped with even more fresh whipped cream. Definitely a chocolate lover’s dream. And in the running along with my favorite Chocolate Peanut Butter Cream Pie. 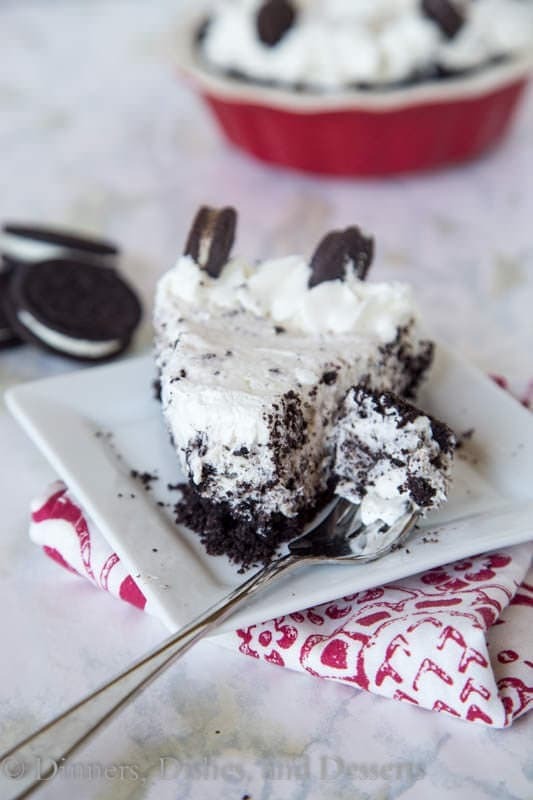 I brought this no bake Oreo cheesecake to a friends house for dinner one night. The only time the kids pretty much stopped talking and focused on eating was during dessert. They all loved it, and the adults raved about it too. 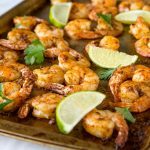 So creamy and great for summer. No Bake Desserts have to be my favorite thing in the summer. 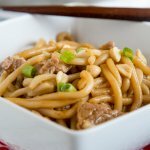 Everyone loves them, and they are so easy to make! 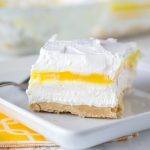 Easy no bake desserts are my favorite in the summer. I just don’t want to have to deal with the heat from my oven when it is in the 90’s outside. 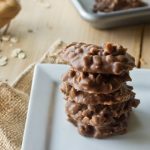 No Bake Avalanche Cookies are ready in about 10 minutes, so they are great when you just want instant gratification! This oreo cheesecake takes a little longer, but is so worth it. The hardest part is letting it set up before you can cut into it. 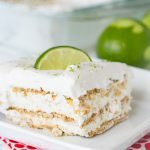 I am pretty sure I am not the only one who relies on no bake desserts to get through the summer either. Please tell me I am right on that one? 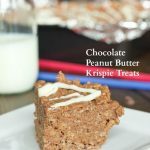 If you are like me, then don’t miss these No Bake Monster Cookie Bars because they are going to become your new best friend. Anything with chocolate always gets me! 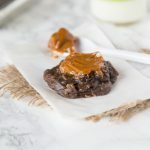 So if you are looking for more no bake desserts for summer, I have you covered. 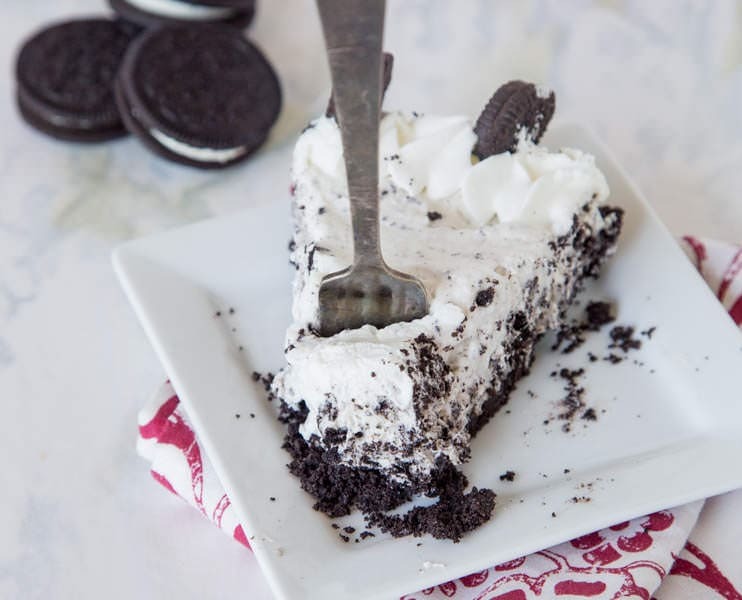 This Oreo cheesecake is a must for sure! 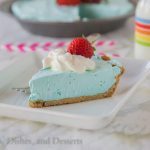 My son is partial to this Kool-Aid pie, that is only 3 ingredients. Probably because he can make it himself. Which is another good reason to like it! Pretty sure he could master this No Bake Berry Pretzel Dessert as well! 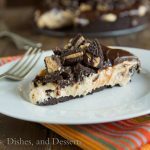 Pick up some Oreo’s next time you are at the store, because this creamy no bake cheesecake is just begging to be made. Bring it to parties, potlucks, or just make it for your family. Or yourself. No judgement here what so ever! 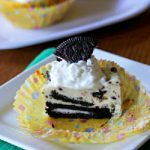 No Bake Oreo Cheesecake - A super creamy no bake cheesecake filled with Oreo's and ready in minutes! In the stand mixer bowl, using a paddle attachment, beat together cream, cheese, and sugar until well combined. Using a spatula, fold in the whipped cream. Once well mixed, fold in the 1 row of crushed Oreo cookies. Pour into prepared crust. Set in fridge for 1 hour. 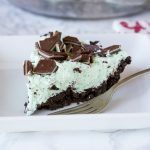 Easy desserts like this are perfect for potlucks! And they always go fast too! I have never met an Oreo dessert that I didn’t love… and so easy! 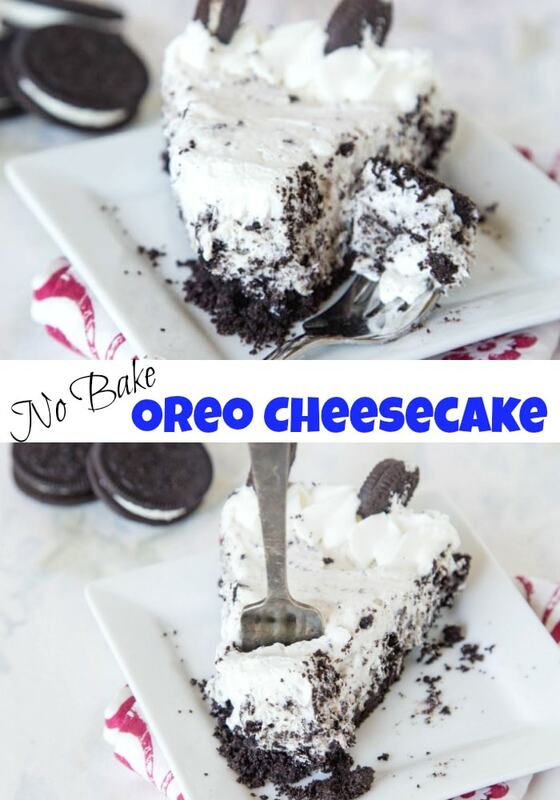 Love no bake, Oreos, and cheesecake…sounds like it’s calling my name! 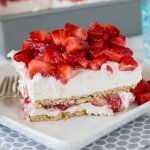 No bake desserts like this are perfect for summer! I can totally see this disappearing really fast! OMG! My kid will love this cheesecake! I love all these flavors! No bake desserts are the best! Such a fantastic dessert!! I LOVE that its no bake!! Oh, this will be a popular dessert in my house! 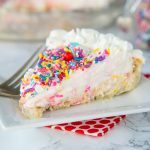 I love pretty much any cheesecake, and the no-bake variety is the bomb! This Oreo cheesecake looks amazing — and so fun for a summer celebration! you might find me in the laundry room by myself with a fork and the pie! LOL looks seriously delicious!